Recently, I’ve been experiencing a very familiar phenomenon: a family member or one of my students will ask the very same question a listener asks me. It’s happened quite a few times already. Like earlier this week when a relative asked me a question about the health benefits of saunas. The cosmos were telling me that I needed to respond to a listener's question. I will talk about cold showers as well. But let me begin by discussing saunas. Listen to Dr. Neal address this topic on Episode 665 of the podcast Optimal Health Daily. The word sauna originates in Finland–in fact, it’s the only Finnish word in the English dictionary. Saunas are thought to have originated in Finland hundreds or possibly thousands of years ago. There are a variety of saunas and they differ somewhat in the way they create heat. When someone refers to a sauna and doesn’t specify the type, it’s assumed that they mean the steam sauna. Traditionally, these involve wood paneled rooms that are heated to a temperature of 158 to 212 degrees Fahrenheit (70 and 100 degrees Celsius). Steam is created by pouring water over heated rocks. The humidity in the room is somewhere between 20 to 40%. Using standard Finnish guidelines, you would spend between 5 and 20 minutes in this environment. Then you would immerse yourself in cold water via a shower or a quick swim, followed by spending some time at room temperature (about 70 degrees Fahrenheit or about 21 degrees Celsius). You would repeat this procedure 2 to 3 more times. The dry sauna is similar, but water is not poured over rocks. As you would imagine, the humidity level is much lower. An infrared sauna, on the other hand, doesn’t heat the air in the room but utilizes infrared technology to heat the body instead. Do Saunas Have Health Benefits? According to the data, yes, saunas may provide some health benefits. Most of the data I am about to present came from studies that examined the health effects from the traditional steam sauna. When we spend time in the environments I just described, our bodies respond by dilating our blood vessels, which means the inner lining of our blood vessels gets bigger. This increases blood circulation throughout the body. It’s possible that this increase in the diameter of the arteries helps make them more elastic, which is a very good thing. It was initially thought that those with a history of heart disease should not spend time in saunas because it would put the heart under too much stress. However, researchers are discovering that it may actually benefit people with heart conditions. Using saunas may also help those suffering from asthma and chronic bronchitis. Some researchers have found that regular use of saunas may decrease pain levels in those experiencing chronic pain like arthritis. Some data has found that infrared saunas provide similar benefits, but there aren’t many of these studies, so it makes it more difficult to reach any real conclusions. Is a Sauna Right For Me? The data on saunas doesn’t mean saunas are right for everybody. You always want to check with your doctor to make sure it’s right for you. Be sure you are adequately hydrated. Do not consume alcohol before using a sauna. Pregnant women would want to avoid using them. Folks that have had a recent heart attack would want to wait a while before using a sauna. Those with a form of low blood pressure (called hypotension) would want to be sure that their doctor clears them before using a sauna. Finally, if you have a skin condition, definitely check with your doctor first. There aren’t as many studies examining the effects of cold water immersion and most of these were performed using athletes as the study participants. I was able to find a review article where researchers collected a bunch of studies on the topic and performed a giant analysis by looking at all of these studies at once. 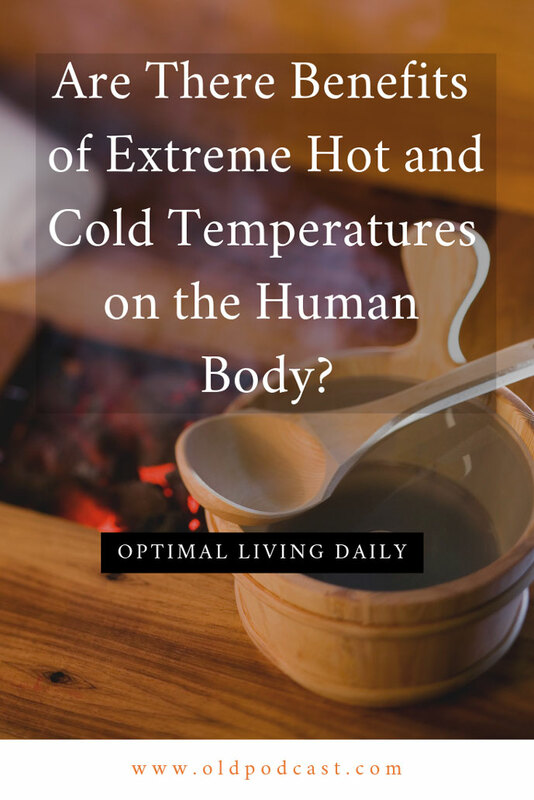 They found that cold water immersion may actually increase the release of stress hormones, stress byproducts, and free radical production. Remember that free radicals–although they sound cool–are likely harmful to the body. The reason you hear so much about the benefits of antioxidants is because they help our bodies get rid of free radicals. A small study found some evidence that bathing in cold water (about 68 degrees Fahrenheit or 20 degrees Celsius) for 2-3 minutes may relieve symptoms of depression. But this is very preliminary so we can’t say whether it really works. The bottom line is this: saunas, particularly steam saunas, may be beneficial for most people. But cold showers, also known as cold water immersion, may not provide any benefits. In fact, it’s possible they do more harm than good.